Franklin Roosevelt (1882-1945) served as America's thirty-second president of the United States. He was elected to an unprecedented four terms and served during the Great Depression and World War II. Franklin Roosevelt grew up in a wealthy family and often traveled overseas with his parents. His privileged upbringing included meeting Grover Cleveland at the White House when he was five. He was cousins with Theodore Roosevelt. He grew up with private tutors before attending Groton (1896-1900). He attended Harvard (1900-04) where he was an average student. He then went to Columbia Law School (1904-07), passed the bar, and decided not to stay on to graduate. Roosevelt was born to James, a businessman and financier, and Sara "Sallie" Delano. His mother was a strong-willed woman who did not wish her son to be in politics. He had one half-brother named James.On March 17, 1905, Roosevelt married Eleanor Roosevelt. She was the niece to Theodore Roosevelt. Franklin and Eleanor were fifth cousins, once removed. She was the first First Lady to be politically active, involving herself in causes like Civil Rights. She was later appointed by Harry Truman to be part of the first American delegation to the United Nations. Together, Franklin and Eleanor had six children. The first Franklin Jr. died in infancy. The other five children included one daughter, Anna Eleanor and four sons, James, Elliott, Franklin Jr., and John Aspinwall. Franklin Roosevelt was admitted to the bar in 1907 and practiced law before running for the New York State Senate. In 1913, he was appointed Assistant Secretary of the Navy. He then ran for Vice President with James M. Cox in 1920 against Warren Harding. When defeated he went back to practicing law. He was elected Governor of New York from 1929-33. In 1932, Franklin Roosevelt won the Democratic nomination for the presidency with John Nance Garner as his Vice President. He ran against incumbent Herbert Hoover. The Great Depression was the backdrop for the campaign. Roosevelt gathered a Brain Trust to help him come up with effective public policy. He campaigned continuously and his apparent confidence made Hoover's meager campaign pale in comparison. In the end, Roosevelt carried 57% of the popular vote and 472 electors versus Hoover's 59. In 1936, Roosevelt easily won the nomination with Garner as his Vice President. He was opposed by progressive Republican Alf Landon whose platform argued that the New Deal was not good for America and relief efforts should be run by the states. Landon argued while campaigning that the New Deal programs were unconstitutional. Roosevelt campaigned on the programs' effectiveness. The NAACP supported Roosevelt who won an overwhelming victory with 523 electoral votes versus Landon's 8. Roosevelt did not publicly ask for a third term but when his name was placed on the ballot, he was quickly renominated. The Republican nominee was Wendell Willkie who had been a Democrat but switched parties in protest to the Tennessee Valley Authority. War was raging in Europe. While FDR pledged to keep America out of war, Willkie was in favor of a draft and wanted to stop Hitler. He also focused on FDR's right to a third term. Roosevelt won with 449 out of 531 electoral votes. Roosevelt was quickly renominated to run for a fourth term. However, there was some question over his Vice President. FDR's health was declining and the Democrats wanted someone they were comfortable with to be president. Harry S. Truman was eventually chosen. The Republicans chose Thomas Dewey to run. He used FDR's declining health and campaigned against waste during the New Deal. Roosevelt won by a slim margin getting 53% of the popular vote and winning 432 electoral votes versus 99 for Dewey. Civilian Conservation Corps (CCC)- hired more than three million men to work on various projects. Tennessee Valley Authority (TVA)- used the Tennessee River to provide electricity for the depressed area. National Industrial Recovery Act (NIRA)- created the Public Works Administration to provide aid to cities for construction and the National Recovery Administration to help businesses. Securities and Exchange Commission (SEC)- corrected abuses which led to the stock market crash. Works Progress Administration (WPA)- hired many people for a variety of projects including in the arts. Social Security Act - Created the Social Security System. One of the election promises Roosevelt ran on was the repeal of prohibition. On December 5, 1933, the 21st Amendment passed which meant the end of prohibition. Roosevelt realized with the fall of France and the Battle of Britain that America could not remain neutral. He created the Lend-Lease Act in 1941 to help Britain by delivering old destroyers in exchange for military bases abroad. He met with Winston Churchill to create the Atlantic Charter vowing to defeat Nazi Germany. America did not enter the war until December 7, 1941 with the attack on Pearl Harbor. Important victories for the US and the allies included the Battle of Midway, the North African campaign, the capture of Sicily, the island-hopping campaign in the Pacific, and the D-Day invasion. With an inevitable Nazi defeat, Roosevelt met with Churchill and Joseph Stalin at Yalta where they promised concessions to Soviet Russia if the Soviets entered the war against Japan. This agreement would eventually set up the Cold War. 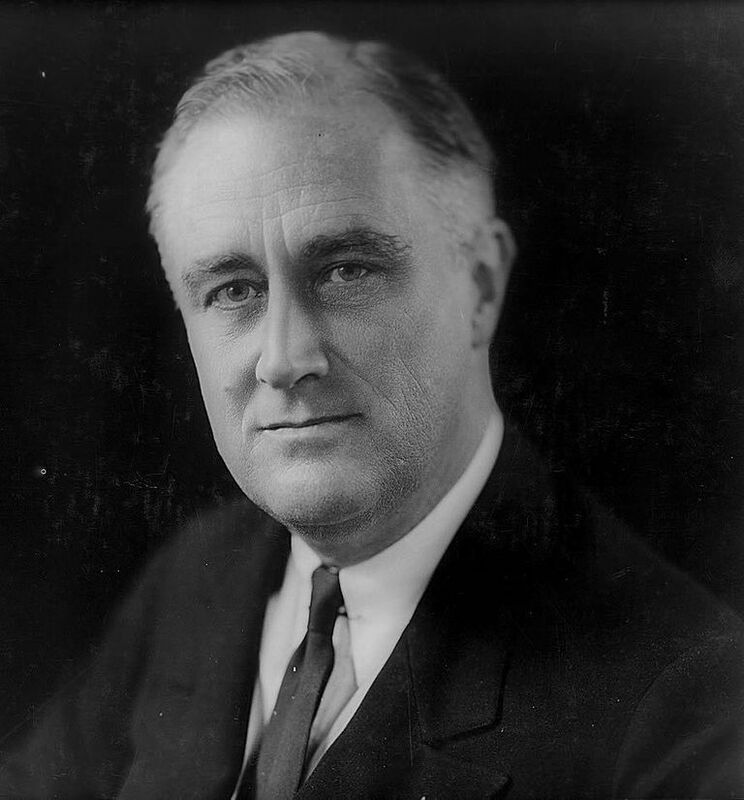 FDR died on April 12, 1945 of a cerebral hemorrhage. Harry Truman took over as president. Roosevelt's terms as president were marked by bold moves to fight two of the largest threats to America and the world: the Great Depression and World War II. His aggressive and unprecedented New Deal programs left a lasting mark on the American landscape. The federal government grew stronger and became deeply involved in programs traditionally reserved for the states. Further, FDR's leadership throughout World War II led to victory for the Allies even though Roosevelt died before the war ended.